Killian, a German Shepard with the Ashtabula County Sheriff’s office in Ohio had a habit of chewing on his metal bowl. As as result he damaged his four canine teeth. Killian’s veterinarian asked her father, a dentist, to perform four root canals, and he chose Moskey to fabricate the crowns. He had relied on Moskey’s expertise in dentures, implants, and in digital crown and bridge for many cases, but did not know whether they had experience with animals. As it happens, they did! 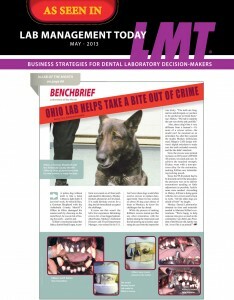 Read the article by clicking on In LMT-May2013-Moskey.